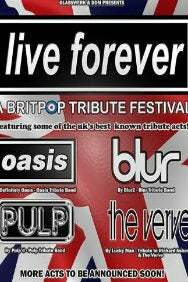 We do not curently have theatre tickets available for Live Forever - Britpop Tribute Festival feat Definitely Oasis + Blur2 + Pulp'd + Lucky Man (Verve). This could be because we have simply sold out or it could be that this show is no longer running. The information on this page remains purely for historical and informational purposes. The definitive tribute to Blur! Blur2 bring the magic of all the classic hits to life with their larger than life personalities and their insane live shows! Pulp’d is a Pulp tribute band. Lucky Man is the first and best acoustic tribute to Richard Ashcroft, one of the best lyricist and performer in the world. Playing all the hits including Lucky Man, Sonnet, The Drugs, Bittersweet any many more.